Dividual Tensifier is a stage set and a sound installation that emulates a ticket office, a meeting point in a prison, or a confession booth. 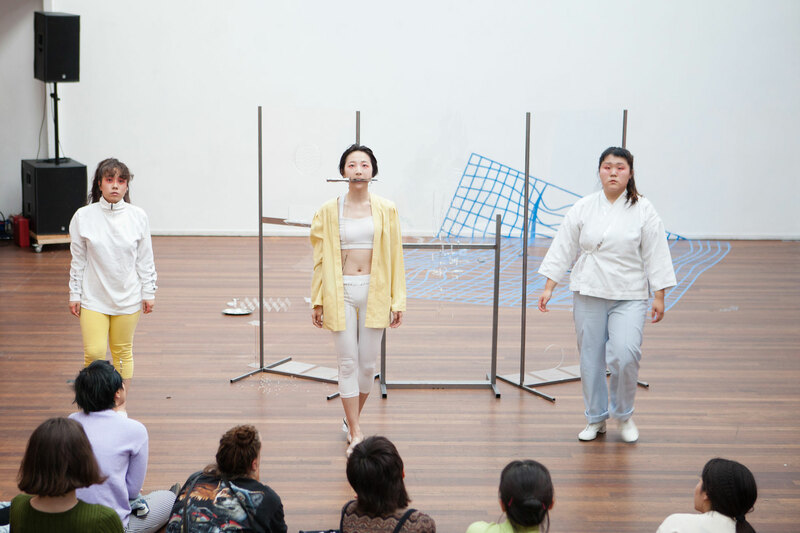 On stage, three performers assume the roles of female human or non-human workers engaged in an immaterial labor system in a realm that is both digital and physical. The stage is continuously transformed by the acts and movements of the performers such that the ticket office becomes a nail salon, the confession booth, a data centre and so on. Here the script for the performance is reproduced together with the audio track that accompanies the performance, and visual documentation of a staging of the performance at the 2018 Sandberg Instituut Graduation Show. "I’m more than happy taking care of other people" she answered. She pushed my cuticle so hard to make them half moons. "For the aesthetic reason" she answered. Look at me up here! 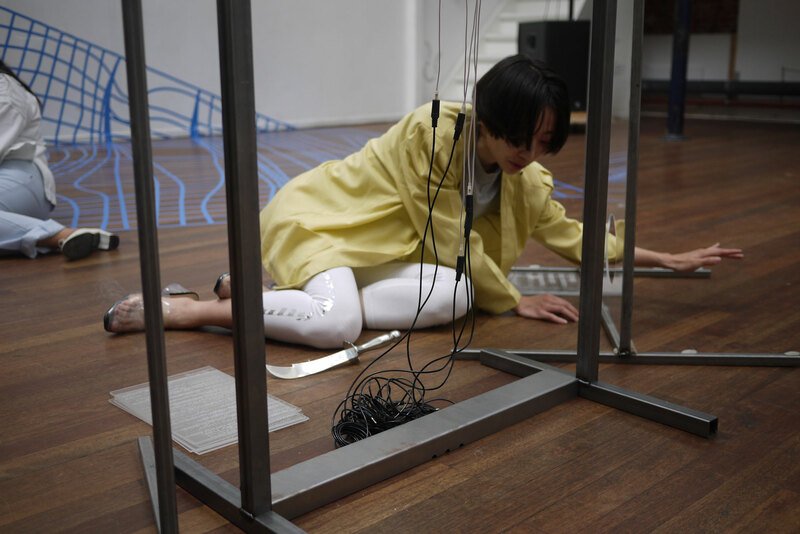 Bin Koh in the performance Dividual Tensifier, Sandberg Instituut Graduation Show, 2018. I seem to have lost my hands around here. Have you seen them by any chance? I feel like I lost my second voice. Bin Koh inDividual Tensifier, Sandberg Instituut Graduation Show, 2018. Well, I just realized that I can’t pay her. I’m so non-profitable and non-fitable. Just like her. Since I realized that I can’t pay her, I pretended to look at the screen on my phone in hopes of avoiding eye contact with her. Swipe. Swipe. Swipe. Swipe. Swipe. Swipe. Swipe. Swipe. I only see many faces. Face here. face there. Mostly white. It’s not fair that they wouldn’t see my face. You know, my face and body were covered by bugs. I could see them and hear them but I couldn’t reach them. I tried to scratch them off again and again. Sorry, There is a bug uploading your bug report. "I’m not crying. I’ve just got sunburn on my eyes" I said. You know what sunburn is? You even know what it feels like? Sunburn is like a human being that makes loads of money from information technology or something and goes on holiday and spends loads of money. That is what sunburn is like. And you better stop calling me darling. You are not allowed to call me a darling. I want to apply for a holiday. Sorry, your application is rejected. Bin Koh and co-performers inDividual Tensifier, Sandberg Instituut Graduation Show, 2018. The practice and research of visual artist/performer Bin Koh (1990, South Korea) is focussed on the mechanization and standardization of human and non-human female voices in a public and digital realm, which often contains ‘sincerity’ and ‘niceness’ as it is carefully managed by a highly performative society. Koh recently graduated from Sandberg Instituut from Master of Voice, exploring a blurry line between niceness and hysteria.